The Justice League has faced many strange threats in their time together, but the so-called Dark Knights may be the greatest threat yet. Seven alternate-universe versions of Batman with all of his training and none of his morals, each one empowered in the same manner as another member of The Justice League! In the case of Barry Allen, The Fastest Man Alive, he is countered by The Red Death – a version of Bruce Wayne who, as part of a desperate attempt to save his Earth, killed his world’s version of The Flash in order to steal his powers. 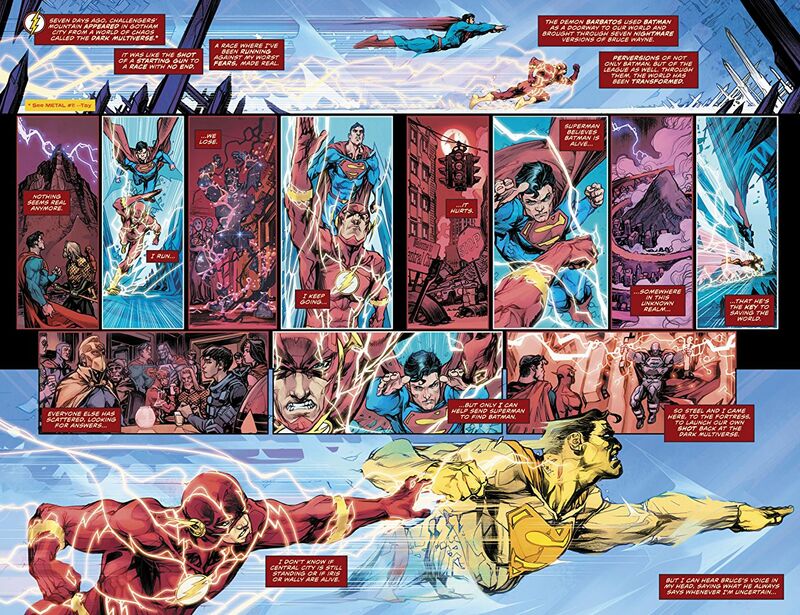 However, this action corrupted The Speed Force within him and now The Red Death drains the life energy from the bodies of those around him as he runs. With The Red Death laying waste to Central City, The Flash is desperate to head home and face his dark doppelganger. But The Justice League needs his help to save the world at large. Specifically, they need him to help Superman breach the barrier between realities so that he can find their Batman while the rest of The League seek out more of the strange metals that are the only thing that can hurt the Batmen of the Dark Multiverse. Thankfully, Barry Allen is good at multitasking and making up for lost time. Unfortunately, The Dark Knights are on the move and two of them are sent to make Barry Allen The Fastest Man Dead! This Dark Nights Metal tie-in comes at a rather odd time for The Flash. The last issue, #32, started a new story-line with several on-going subplots moving forward. Among these were Barry Allen’s difficulties in controlling his powers following the latest attack by The Reverse Flash, Iris West pushing him away in the wake of her killing The Reverse Flash to save him and his starting a new job as a staff CSI at Iron Heights Prison. None of this is addressed in this issue, with the exception of Barry talking to Iris for the first time in a long while. It’s a minor point and part and parcel of comic-book crossovers. Still, it does raise questions about just when Bats Out Of Hell takes place relative to the stories in the books tying in to Dark Nights Metal. It also takes the wind out of the sails regarding the current story in The Flash and right after a great jumping-on issue for new readers! The Flash #33 works somewhat better as a Dark Nights Metal tie-in. 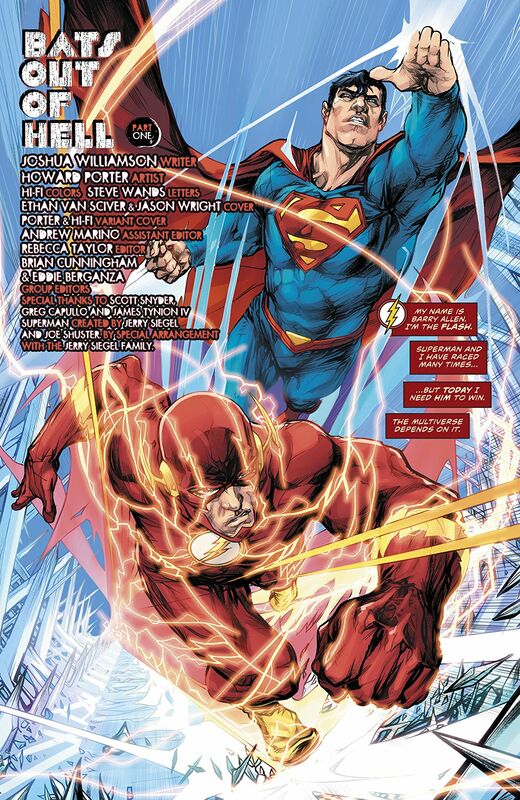 Joshua Williamson’s script does a great job of explaining the story to date and catching-up those Flash fans who might not have been reading the crossover. Unfortunately, despite a sense of urgency to the story and Barry running himself ragged for most of the issue, there’s little in the way of actual action. The story here is primarily concerned with exposition and setting up the next big challenge and it manages that task well. Thankfully, Howard Porter does a fantastic job of depicting what action there is. Porter’s run on JLA with Grant Morrison twenty years ago is still fondly remembered and Porter’s work has only grown stronger since then. The colors by Hi-Fi are brilliantly applied, with a variety of palettes in play as the settings shift. The only real artistic weak-spot lies in the lettering, with the dialogue of The Batman Who Laughs nearly unreadable, rendered as it is with dark red text on a black background. The Flash #33 is a fantastic continuation of Dark Nights Metal but isn’t a good representation of what the series is usually like. 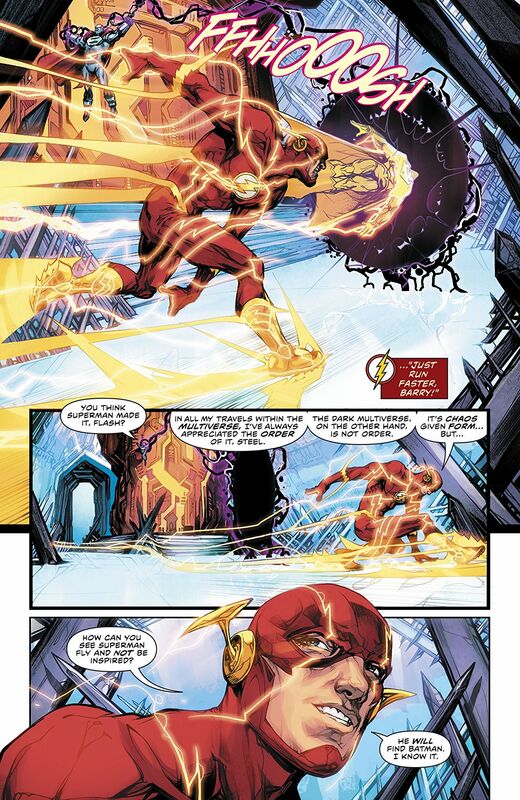 Despite featuring the same great writing and artwork as the usual bi-monthly book, most of the story elements that make The Flash unique are missing here. Those who are curious about what Barry Allen’s comic adventures are usually like would do well to check out The Flash #32 or wait two weeks for The Flash #34. 9/10.